For the fourth consecutive year, Berkeley College has ranked among the Best Online Bachelor’s Programs for Veterans by U.S. News & World Report, placing at No. 65. Earlier this week, U.S. News & World Report cited Berkeley College as among the Best Colleges for Online Bachelor’s Degree Programs, placing at No. 119, also for the fourth consecutive year. Colleges are ranked by U.S. News & World Report on factors such as student engagement; faculty credentials and training; student services and technology; and peer reputation. To view the full rankings, click here. To read more about the methodology used by U.S. News & World Report, click here. Berkeley College began offering online courses in 1998 and online degrees in 2003. As of fall 2016, more than 3,200 students are enrolled in at least one online course, selected from more than 190 undergraduate and graduate courses. To date nearly 2,500 students have graduated with online degrees. In September 2016, Berkeley College celebrated the growth of its distance learning program with the opening of the new Berkeley College Online® offices in Paramus, NJ. The space accommodates administrative and support services that serve thousands of Berkeley College students. Berkeley College Online students have access to the same support services as students who attend on site, including Academic Advisement, the Library, the Center for Academic Success, and Career Services. Online campus life experiences include online clubs, social media engagement, wellness and personal development programs, and workshops focusing on student success. Click here to learn more about Berkeley College Online. More than 500 military students and veterans are enrolled at Berkeley College in New York and New Jersey, and through Berkeley College Online. Berkeley College participates in the Yellow Ribbon Program under the G.I. Bill and collaborates on national ventures with the National Guard, the Army and the Air Force, the GoArmyEd distance learning program, and the Navy College Program Distance Learning Partnership. The Berkeley College Office of Military and Veterans Affairs provides support to its student-veterans through six on-site veterans resource centers (VRCs) in New Jersey and New York, as well as through an Online VRC. At the VRCs, military students can meet with staff, network with their peers, and learn about Veterans Administration benefits. Click here to learn more about the Berkeley College Office of Military and Veterans Affairs. 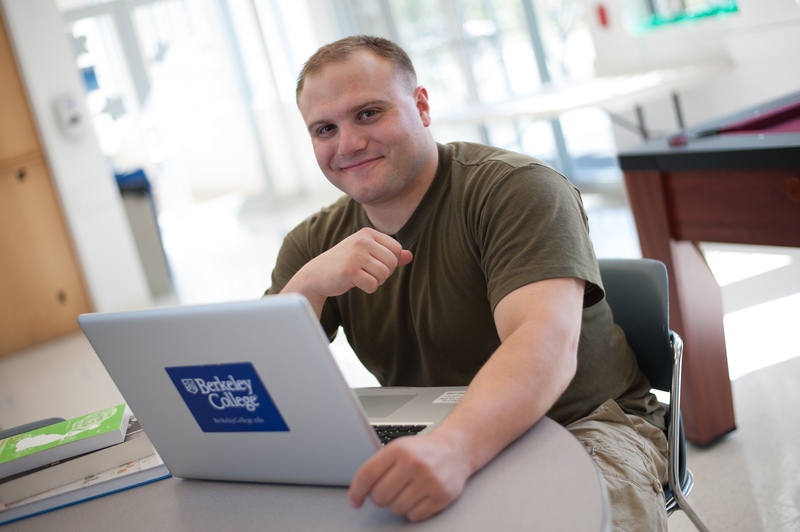 Photo Caption: For the fourth consecutive year, Berkeley College has been ranked among Best Colleges for Online Bachelor’s Programs, and among the Best Online Bachelor’s Programs for Veterans, by U.S. News & World Report. Pictured above: The Berkeley College Office of Military and Veterans Affairs provides support to its veteran students through six on-site veterans resource centers (VRCs) in New Jersey and New York, as well as an Online VRC. At the VRCs, military students can meet with staff, network with their peers, and learn about Veterans Administration benefits. Berkeley College has three New York campuses – Midtown Manhattan, Brooklyn and White Plains. In New Jersey there are five campuses – Dover, Newark, Paramus, Woodbridge and Woodland Park. Berkeley College Online® serves a global population. The website address is www.BerkeleyCollege.edu.